I cheated a little bit for today's entry. Several months ago, for Courtney's birthday, I gave her season tickets for us to go to the series of touring Broadway musicals that would be coming through Lubbock this year. Upper mezzanine, Saturday matinee - that's how I roll. It's been a really fun thing to do together! We ditch the kids, go to the show, and then we usually all eat out for dinner after. 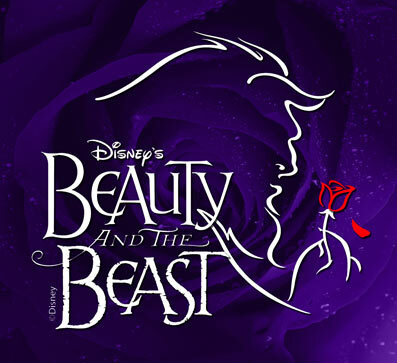 So far, we've seen Fiddler on the Roof, The Aluminum Show, and today's performance of Beauty and the Beast. (We'll see our last one in April, Legally Blonde.) Anyway, this wasn't a movie, but I figured it fit the criteria of Project Valentine closely enough for it to count. I enjoy (most) Disney movies and productions a lot. That said... I would like you to think of your favorite movie. Now make an estimate of how many times you have seen that movie. Got it? OK, now I want you to multiply that number by 50, and that is how many times you will watch every single Disney movie in your DVD collection once you have children. And then a new Pixar movie will come out, and you will watch it that many times, too. 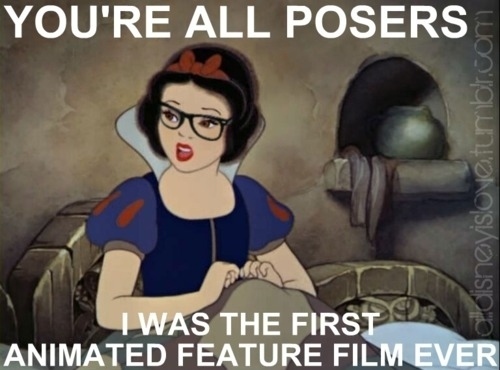 Your enthusiasm for Disney movies will be dimmed, to say the least. In fact, you know why I'm just now writing up a show that ended hours ago? Because the kids wanted to watch Mulan before bed, and Ava went to sleep on my lap. 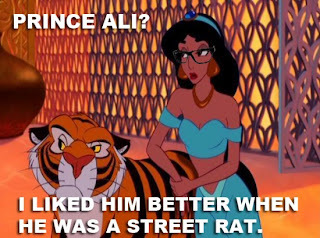 So anyway, I love Disney shows, but if I offer some criticism, it comes from a place of love. Remember in my review of Damage, how I said that when you watch a bunch of a certain type of movie, you see trends emerging that you may not have otherwise seen? 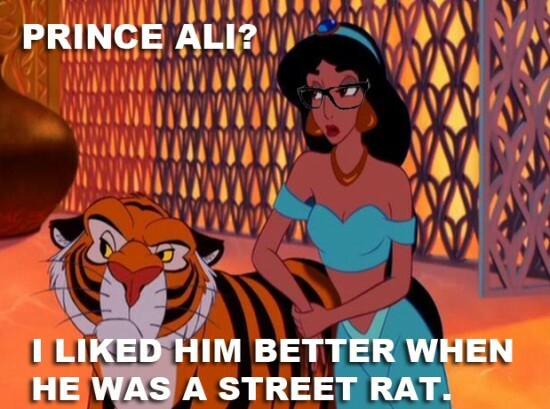 Here are some things that I have noticed about Disney princess movies. Disney princesses seldom have mothers, and sometimes have no living parents at all. They chafe at the life presented to them, and buck tradition. Rapunzel: Just wants to go outside, MOM! If it's a movie where the villain dies, it's always done in a way that allows the hero to keep his hands clean. Aladdin: Jafar becomes a genie and is confined to a lamp. OK, none of that really matters to this review, but at least now your head is filled with the same thoughts that mine was filled with when I went into this show. And really, everybody knows this story already, right? I don't really need to recap this one for you, do I? Belle is a beautiful but restless girl who lives in rural France with her father, a kooky inventor. The loutish Gaston wants to marry her, but she has other plans for her life. Her dad gets lost in the woods and is taken prisoner by a horrible beast, who used to be a selfish prince, but has been cursed, along with his entire household. 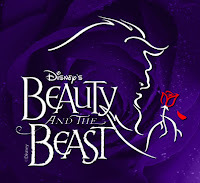 Belle exchanges herself in return for her dad's freedom and ends up falling in love with the beast, which transforms him back. This only serves to confirm my theory, mentioned several times during Project Valentine, that the best way to find true love is to spend time with somebody who you hate at first. This was actually the third time I've seen a stage production of B&tB. The touring show came to Lubbock about ten years ago, and the music department at my church staged it about four or five years ago. Today's production was very good, very enjoyable, but I'm still going to put it at the bottom of the three productions. The set design was much more abstract than the others. It was good for evoking a mood, but not really my taste. Also, the costumes for the beast's estate members were not great. If I had never seen this before, it really wouldn't be all that clear that they are supposed to be items, except for Lumiere the candlestick. Babette, the featherduster, really looked nothing like a featherduster, and the woman who turned into a wardrobe really looked nothing like a wardrobe. And yes, I realize how difficult it is to make a person look like a featherduster or a wardrobe, but the other productions didn't seem to have a problem with it. That said, it was still well staged, and the leads were all very talented. 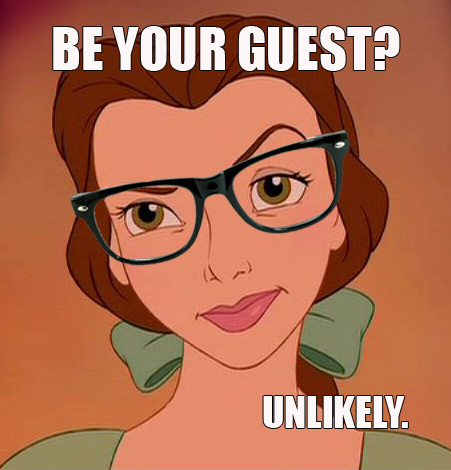 Liz Shivener played Belle, and had the perfect voice for it. The character of Gaston is a lot of fun in the hands of the right actor, and Nathan Hackmann knocked it out. The stage show has a few additional songs that aren't in the movie that keep it a little more interesting for parents who have worn out their copy of the DVD. Best of all, it was two and a half hours of sitting next to Courtney with my arm around her. LESSON - Don't judge a book by its cover. Also, creative gifts (like an entire library for a girl who likes books) go a long way towards winning points. 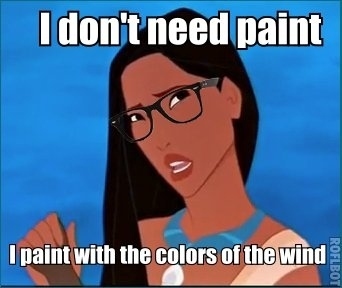 BONUS - Enjoy these pictures of Hipster Disney Princesses! You know, when a friend of yours has been pent up with the kids too long and can deconstruct the entire Disney catalog before the super nachos are gone you say to him, "dude, you gotta get out more." What that advice doesn't suggest is for him to "get out" and run to the very entertainment he should be "getting out" from. Granted, you had a redhead on your arm, but I fear she needs help too. I've called a deprogrammer who specializes in Stockholm Syndrome. Go easy big man, help is one the way. No, man - I'm good. I can quit anytime I want to. What, that? No, that's for my kids. I think you should just put it down. 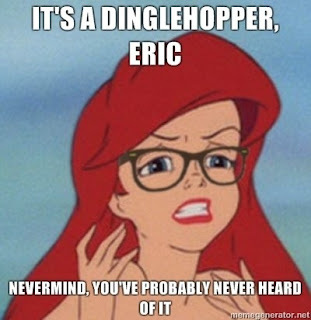 Ha ha... No, I'm not upset, I just wish that you would quit messing around about taking away my Disney movies. I am NOT shouting! I need you to leave now. Put Little Mermaid in the player on your way out. i think it's important to teach our daughters to marry by sixteen lest they turn into unloveable spinsters. that, and they had better find a man to save them - they are far too weak, fragile and unintelligent to do it themselves. i thank these movies for taking some of that burden off my shoulders. Yeah, I'm not the awesomely indie parent I once envisioned, either. But you know, the first time your little girl holds an Ariel doll and bats her eyes at you, well, that's like heroin right there.